When a spy mission against Cobra Industries goes awry, a young G.I. JOE team is forced to hit the road as fugitives. Now the group -- Duke, Scarlett, Roadblock, Tunnel Rat, Ripcord and Snake Eyes -- must use their wits and elite training to prove their innocence to the world before being caught by the authorities, Cobra or another elite military team called the Falcons. But can the G.I. JOE team avoid capture long enough to clear their names and bring real justice to Cobra? YO JOE! Fans of the popular animated series G.I. JOE: RENEGADES rejoice! On September 25, 2012, G.I. 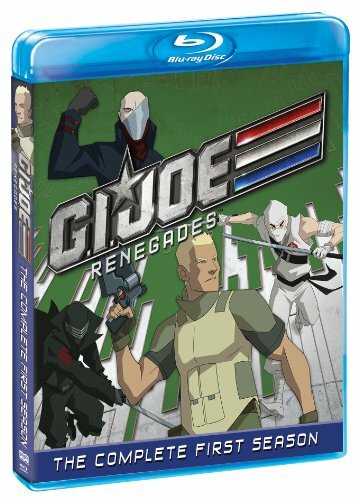 Joe: Renegades The Complete First Season Blu-ray Collection debuts on home entertainment shelves from Shout! Factory, in collaboration with Hasbro Studios. This highly anticipated 3-disc Blu-ray set collects all 26 adventure-filled episodes and an original behind-the-scenes look at G.I. JOE: RENEGADES bonus feature. Delivering exciting, action-packed storytelling and spectacular animation, this special Blu-ray collection is a must-have for fans and collectors of all ages and has a suggested retail price of $49.97. This Blu-ray collection is now available for preorder at Amazon.com. Also available to own on the same day is the G.I. JOE: RENEGADES Season One, Volume Two DVD set, highlighting the second half of exhilarating episodes from the first season. G.I. JOE: RENEGADES is produced by Hasbro Studios and boasts an incredible voice cast, including Charlie Adler (Transformers: Revenge of the Fallen), Natalia Cigliuti (Saved by the Bell: The New Class), Jason Marsden (Batman: The Brave and the Bold), Johnny Messner (Tears of the Sun) and Kevin Michael Richardson (TRANSFORMERS PRIME), as well as special voice appearances by Clancy Brown (Carnivale), Michael Emerson (Lost), Daniel Dae Kim (Hawaii Five-O) and Lee Majors (The Six Million Dollar Man), among other notables! As excitement builds for this Blu-ray collection, Shout! Factory will announce in-depth bonus feature and additional news in forthcoming months. (c) 2012 Hasbro, Inc. All Rights Reserved.